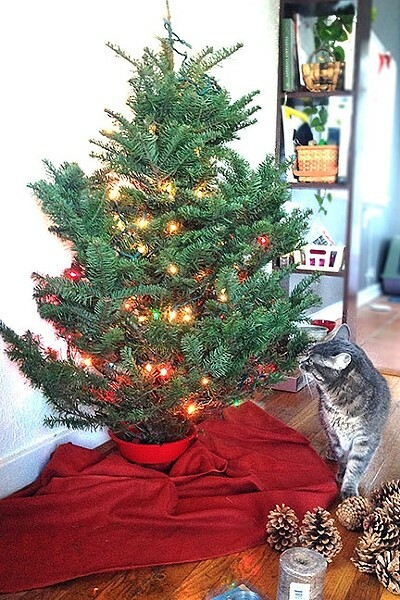 I'm as enthusiastic as anyone about Christmas trees and the rituals associated with them. There's getting the tree: Gathering up the family, bundling up in the cold, bantering in the car, the smell of hundreds of firs, the nice people who help you pick one out, and the challenge of angling it through your front door. 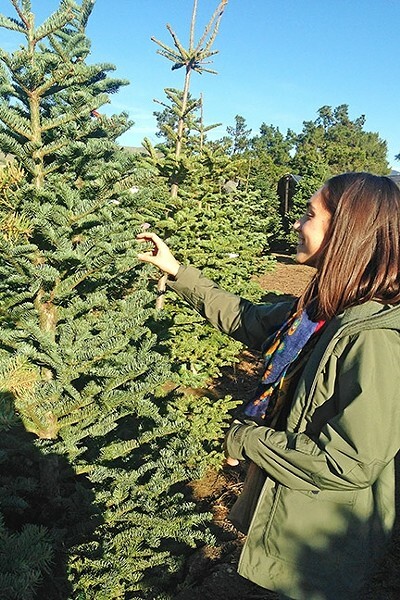 FEELIN’ IT OUT : Clare checks out one of the trees at Brookshire Farms in San Luis Obispo. Then there's the rest of the day: Decorating it with ornaments (some of which you made in second grade and, embarrassingly, your mom still has), listening to Christmas music, and then waking up each morning after, eagerly hoping the mound of presents underneath gets bigger. I went crazy for it all as a kid, as most do. Some people treasure Christmas for what it signifies in Christianity. The religious aspect was never a part of my childhood (although you could call my fervent belief in Santa Claus religious), but I did appreciate the story of Jesus Christ. The nativity scene creeped me out a little, as did Christ's saga in general, but not in a bad way—more in the way that gave me chills and made me feel something deep. It's a feeling that rekindles inside every December that rolls around. In short, Christmas means a lot to me. This is my first Christmas spent in San Luis Obispo. But the problem is I'm neither a kid nor a parent right now. I rent a small apartment with my girlfriend, Clare, in SLO. She and I are both really busy and haven't found the time to partake in any holiday cheer. AFTER: The tree we picked out was 3 to 4 feet tall. I had ambitions for a 10-footer, but it wasn’t meant to be in a small space. As you can see, our cat isn’t so sure about the set up. But I couldn't let a Christmas slide without at least getting a tree. So, at my request, we ventured out Dec. 17 to go tree shopping. I had big ambitions. We were going to get a classic tree. Our living space is small, but our ceiling is pretty tall. I assumed an 8- to 10-foot tree would work great and bring the Christmas spirit to our home. First, we needed a tree stand. Miners? Sold out. Home Depot? Sold out. Target? One stand left! And while we're at it, why not a bag of pine cones too? We were feeling the holiday spirit extra hard while driving out of the shopping center, when a veteran dressed in Army gear stood flashing a sign that said he needed $65 for a bus ride home to his family for Christmas. Before Clare could even pull a dollar out of her purse, the guy behind us was opening his car door to give the vet a ride. Way to go, SLO. Up next for us: the tree itself. We opted for a hyper local place, Brookshire Farms on Broad Street. Brookshire had great-looking trees with super nice and helpful people. But I was quickly realizing my dream of a 10-foot Douglas fir was preposterously unrealistic in our living space, unless we were willing to block hallways to the kitchen or bedroom. After throwing a mild fit with Clare about the size, I relented and opted for a 3- to 4-foot mini tree for around $30. And it came with a little stand ... so much for the previous hour and a half we spent shopping for one. 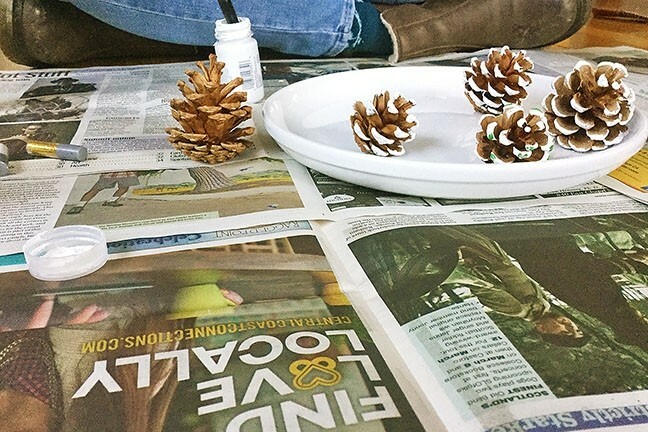 FUN WITH PINECONES: New Times makes a great community newspaper and a nice protective layer while painting pine cones. These guys made their way to the tree as ornaments. After a quick stop at Fred and Betty's Thrift Store to pick up some fabric for a tree skirt and lights, we spent the rest of the afternoon lounging by our new tree, making wreaths, painting pine cones for ornaments, playing with our cat, and listening to the classic Christmas tunes. Christmas may never feel like what it did as a child, but it was nice to rekindle some of the magic—all it really takes is a whiff of fir. Staff Writer Peter Johnson is hoping the pile of presents grows under his tree at pjohnson@newtimesslo.com.